Hosting a neighborhood holiday party is a great way to reconnect with old friends and welcome new families to the community. And it doesn’t necessarily require a huge investment of time or money. Plan a potluck dinner and ask your guests to bring a dish or drink to share. Or host a holiday cookie exchange and ask everyone to bring a couple dozen of their favorite cookies to swap with other guests. Hot cocoa and caroling is another great way to bring neighbors together to celebrate the season. If you have a neighbor who you’ve been at odds with in the past, consider extending them an invitation, as well. It could be the perfect opportunity to make peace in the new year. The holiday season is the perfect time to offer help to a neighbor in need. Next time you head out to rake your leaves, take care of an elderly neighbor’s, as well. Or drop off dinner for a friend who is recovering from surgery. If you know of someone in your community with a larger need, consider setting up a Care Calendar through a site like CareCalendar.org. Then share the link with other neighbors who may be interested in helping, too. Users can sign up to run errands, cook a meal, babysit, wash laundry, clean the house, mow the lawn, or complete other household tasks depending on the individual’s needs. Even a small gesture of kindness can make someone’s holiday extra jolly. Don’t be a Grinch when it comes to tipping at the holidays. Your waiter, your Uber driver, and your hairdresser will all appreciate an extra-generous tip this time of year. International etiquette expert Sharon Schweitzer recommends that you start by setting a budget for holiday tips and prioritizing those you most want to thank.3 Place those who help you most frequently at the top of your list—such as your trusted housekeeper, nanny, or daycare provider. For those you regularly tip at the time of service, consider frequency and length of the relationship to determine an appropriate amount. Everyone could use a little extra cash around the holidays. If you can afford it, share a bit of your abundance with others. Santa isn’t the only one working on Christmas. Emergency workers, hospital staff, airline employees, toll booth attendants, movie theater staff, and many others will be working to make your holiday safe and bright. Say “thank you” by bringing breakfast to the firehouse or police station on Christmas morning or by dropping off a tray of goodies for the hard-working hospital staff on New Year’s Eve. Keep a stash of treats or coffee-shop gift cards on hand to pass out to those you encounter working over the holidays. And, if appropriate, a generous tip is always appreciated! As temperatures drop, some members of our community will be left out in the cold. Our local homeless population is especially vulnerable this time of year, but so are many families living in poverty. Health experts warn that a two-degree drop in body temperature can result in reduced heart rate, lack of coordination, and confusion, making it difficult for adults to work and children to learn.4 You can help by bringing your old but gently-used coats to a collection site. Leave a note in the pocket wishing the recipient a warm and happy holiday. Or tie a scarf around a tree and attach a sign that says: “I am not lost. If you need this to stay warm, please take it!” Check with local homeless shelters to find out if they accept donations of old blankets. Well-worn blankets and towels can often be donated to an animal shelter to help keep four-legged friends warm this winter, as well. Some large retailers offer layaway options during the holidays so that shoppers can pay for their purchases a little at a time. Media stories often surface this time of year about anonymous donors who pay off a stranger’s layaway account to the surprise and delight of the recipient. This is a great way to help a family that may not qualify for charitable assistance but is on a limited budget for holiday gifts. If you have a particular interest in helping kids, you can ask to pay off an account that consists primarily of children’s items. You don’t have to drop a bundle to become a family’s “Secret Santa.” Ask the layaway attendant to search for accounts with balances that fit within your budget. To make a bigger impact, ask friends and family members if they want to pitch in to help, too. One of the most popular ways to give back during the holidays is to participate in a toy drive. There are a number of great charities that collect toys for children of low-income families. Before you shop, find out if the organization has a wish list of preferred items or guidelines for wrapping and labeling the gift. And check the drop-off deadline to ensure your gift will reach its intended recipient in time. 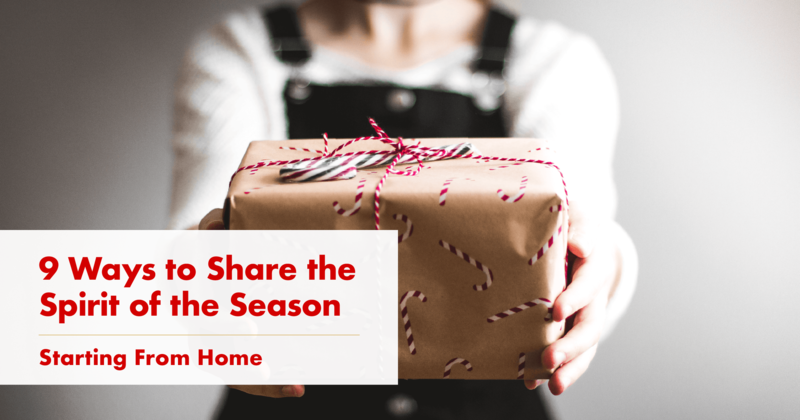 If you have children, involve them in the process of selecting and purchasing the gift so they can experience the joy of giving to those less fortunate, too.